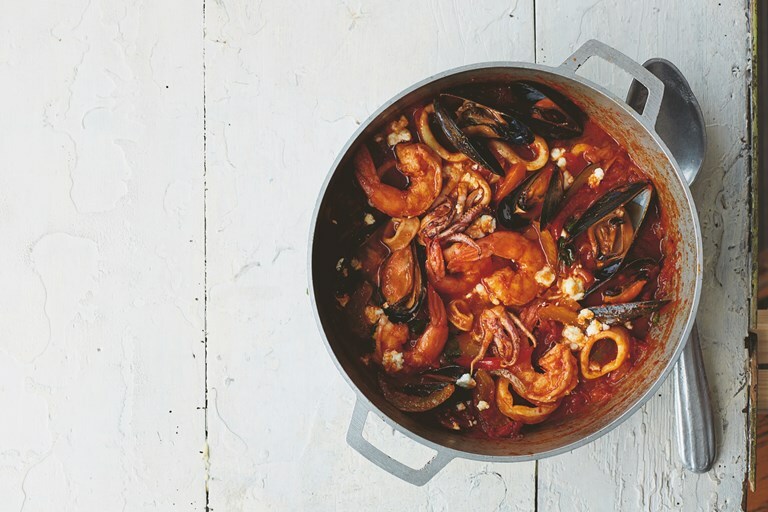 This seafood tagine recipe is a wonderful one-pot dish that sees squid, mussels and prawns gently simmered in a richly spiced and fragrant tomato Moroccan tagine. A wonderful weeknight dinner that celebrates seafood in all its glory. This recipe is taken from Casablanca: My Moroccan Food by Nargisse Benkabbou (Mitchell Beazley, £20). Image by Matt Russell. This tagine is seafood paradise on a plate, or at least that’s how I like to think of it. I developed this recipe a few years ago when I was trying to come up with a seafood tagine to surpass all others – one that every single person would love. So this is supposedly the definitive seafood tagine recipe – charmingly fragrant, not too sweet, not too spicy and full of seafood goodness. So far it has succeeded in making everyone who has tried it happy. I love this topped with a generous sprinkling of feta, which I realise isn’t a typical Moroccan ingredient, but it gives a nice salty, tangy kick to the whole dish.